Need to log in with no keyboard, the solution is very easy in Windows 7, not only on Tablet PCs and Desktop Computers and MS Surface! Please see the screenshots (1 & 2) for login without the keyboard, via virtual keyboard, it is very easy to log in without a keyboard under windows 7 and other! See also: ► ... find and run the Windows 7 On-Screen Keyboard! Instead of relying on the physical keyboard to type and enter data, you can use the Windows-7 On-Screen Keyboard. On-Screen Keyboard displays a visual keyboard in Windows 7 with all the standard keys. You can select keys using the mouse or another pointing device, or you can use a single key or group of keys to cycle through the keys on the Windows-7 screen. Buttons ergo Keys in other layouts may not match exactly the keys on a US keyboard. For keyboard shortcuts in which you press two or more keys at the same time, the keys you want to press are separated by a plus sign. For keyboard shortcuts where you press a key immediately followed by another key! Windows-7 - FAQ-22: On screen keyboard at logon (login) in windows 7, log in without keyboard? How to type a password into windows without a keyboard? How to activated virtual keyboard on windows 7 while entering password? 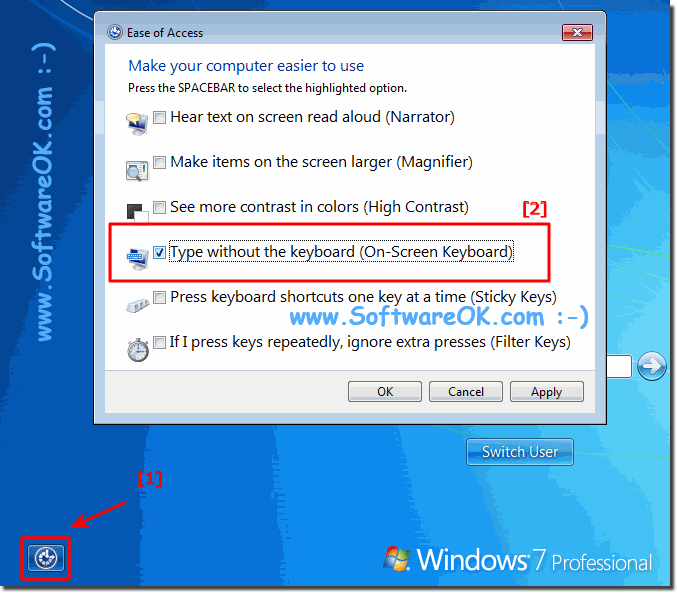 How to open onscreen keyboard in windows 7 lock screen? How to use PC while typing password without keyboard? How to type computer without keyboard on profile login? Command Key to Boot Windows to an Other Login or Admin Login? Enable virtual keyboard windows while login? Shortcut to stop direct keyboard on windows login screen? How to activate screen keybord after login in win 7 ultimate? How to access the on screen keyboard in windows 7 to type in the password? How to open virtual keyboard while giving user name password? How to select virtual key board for sony vaio to enter password? Touch Keyboard from Appearing at Login? How can get get onscreen keyboard to show on my passworded laptop? How to turn on the on screen keyboard from sogn in screen? How to put the virtual keyboard on the logon of windows 7? How to stop the keyboard popup on opening in windows 7? How to enable on screen keyboard windows 7 login screen? Login to windows 7 without password at login screen? How to log someone out of windows with the keyboard? Disable change keyboard logon screen windows 7? On screen keyboard disappears after logoff windows 7? How to revove on screen keyboard at start up windows 7? How to stop on screen keyboard on startup windows 7? Is it possible in new windows seven to login without keyboard? Can I starting Windows 7 without keyboard i need to enter safe mode in order to login as an Administrator? How is it possible to enter a login password on Windows-7 without a keyboard? How to remove the keyboard from welcome screen on windows vista? Window 7 on screen keyboard does not appear on logon screen? How to turn off virtual keyboard after start in win seven? Navigating at the login screen in windows 7 with the keyboard? How to enable logon screen during startup in windows 7? How to open a virtual keyboard on windows 7 without windows login? How to open virtual keyboard during login in windows7? Help, how can I log on without a keyboard on Windows-7? Entering window password without a keyboard? How to enable onscreen keybord without a keyboard in windows? How to disable virtual keyboard on startup of windows 7? How change wndows 7 password without keyboard? Stop windows from always launching on screen keyboard? How to disable on screen keyboard in win 7 logon? How to disable on screen keyboard windows 7 at login? How to disable windows on screen keyboard in win 7? How to turn off on screen keyboard in windows 7 on logon? How to disable the keyboard in computer without any software? Stop windows 7 virtual keyboard from loading after login? Windows 7 screen keyboard always on when login? How to switch off on-screen keyboard when i log in for windows 7? Automatically start on screen keyboard at logon for windows 7? Enter password without keyboard at logon screen? How to remove the onscreen keyboard in win 7 at log in? Disable the on screen software keyboard on windows 7 login screen? Login on screen keyboard windows 7 how to bypass windows 7 login screen with no keyboard? Enter windows password without keyboard and using on screen keyboard for login windows 7? How to login in windows 7 with on screen keyboard? What to do to enable on screen key board while booting? How to bypass windows 7 login screen with no keyboard and using command prompt? How to open the on screen keyboard in the windows 7log in screen? Remove virtual login keyboard on windows 8.1 startup screen? Onscreen keyboard shows up when system is logged in? How to type password without keyboard, how to bring up home screen keyboard on logoff pc? How to generate onscreen keyboard to type windows password? Hiw to start on screen kyeboard in windows 7 during entrng password? How to enable on screen keyboard to enter laptop password? Windows home server activate on screen keyboard logon? Onscreen keyboard starts when i log in how to turn it off? Using the virtual keyboard to enter password on windows 7? How to start on screen keyboard on lock screen in windows 7? How to use on screen keyboard for entering pasword to login? How to enter login password in Windows 8.1 by on screen keyboard? How do I activate my onscreen keyboard during computer startup on Windows 7? Can't open on screen keyboard at windows login? What can i do to typ computr psward without keyboard? How to load on screen keyboard during system booting? How to open virtual keyboard to enter password windows 7? 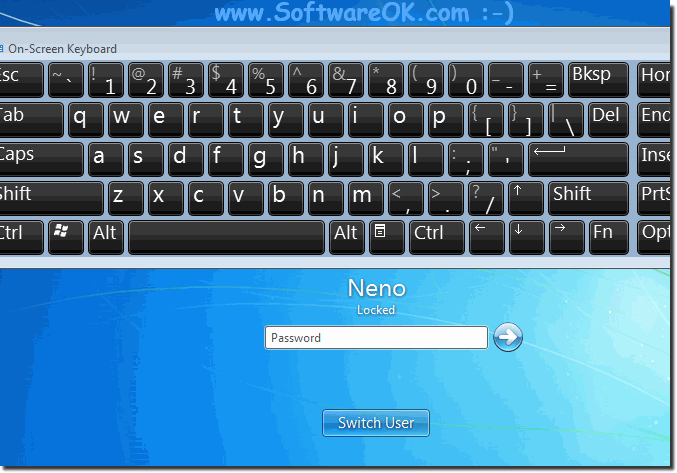 How to enable onscreen keyboard in windows7 when password screen? Visual keyboard windows 7 automatically at start computer? How to take virtual keyboard without logging in into computertt system? How to switch to british keyboard mode in windows 7 login? How to open on screen keyboard on windows 7 at login screen? How to remove the start on screen keyboard picture on the window when the security password is enter? Windows 7 display on screen keyboard at prompt? How to use onscreen keyboard to enter my password on my laptop? How to open on screen keyboard in password inputing windows 7? How to get virtual keyboard on login screen windows 7? On screen embedded login keyboard windows 7? How to open virtual keyboard on password time on lapy? Windows 7 logon screen how to choose user using keyword? Activating onscreen keyboard to onput password? Windows sign in no keyboard to enter password? On screen keyboard opens every time i log into windows 7? How to use android as keyboard at win login screen? On screen keyboard appears on startup windows 7? Turn on, o nscreen keyboard on login screen for windows 8? How to prevent on screen keyboard in win 7 ultimate login screen? How to get on screen keyboard before login? How to put on screen keyboard to windows loging? How to use onscreen keyboard while typing password? How to virtual keyboard windows password? FREE ON SCREEN keyboard for windows ON EVG7 TABLET? How to bring up onscreen keyboard in the password area? How to use virtual keyboard in pc to enter password? Does window 7 have onscreen keyboard when pasword? How to use onscreen keyboard to enye password onlock screen in windows 10? Cara buka keyboard virtual saat laptop terpassword? How to login in with windows 7 ultimate screen keyboard? How to start onboard keyboard on my laptop oj login screen? How to use virtual keyboard at startup on vaio laptop?